I'm not giving you the pattern for the base hat, but I do recommend using a SC pattern. 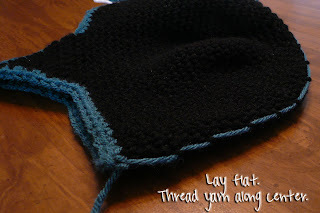 I highly recommend my "Pat Hat" Pattern, but you're free to use any pattern you like. OK, so once you've made your SC base hat (ear flaps are optional), you'll need to mark the center of the hat where you'll attach the mohawk. I just smash the hat flat & then thread a needle/yarn along the ridge. Next, prepare your mohawk "hairs". I've found that 4" hairs are just about perfect. 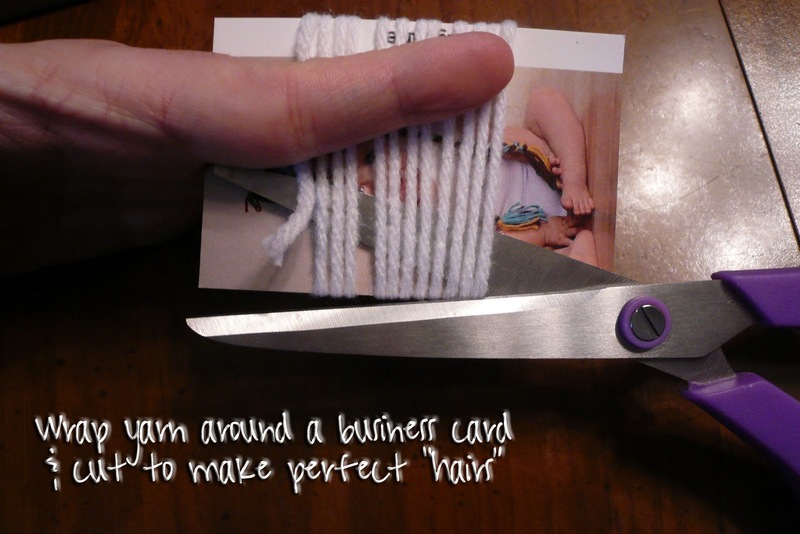 So I wrap the short side of a business card & then cut along the bottom to get a bunch of nice even hairs all at once. You'll have to do this several times. Now you're ready to start attaching the hairs to the hat. I use a latch hook tool (got it for about $2 at Hobby Lobby). If you don't have a latch hook tool, you can do it with a crochet hook. I hold 2 pieces of yarn at a time & loop them between the SC stitches. There's really no exact method to this part. 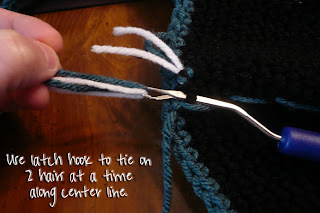 Just follow your center string & make the "rows" of hairs 3-4 stitches wide... or wider if you want. It takes a little creativity near the top-center, but you really can't mess it up. Pull the center string out as you go. It's time consuming, but pretty simple. And it looks AWESOME! :) Enjoy! So glad you posted this tutorial. Not sure when I will get to ever try this but atleast now I "can"! LOVE IT! Everytime I click on the Free "Pat Hat" Pattern, it goes nowhere. Can you fix it? THANK YOU and THANK YOU for sharing this Tutorial! thanks for sharing yet another wonderful pattern. You are amazing. Keep up the great work! My dad JUST asked me to make him one of these hats for the UofM football games. Thanks so much for this tutorial! Thanks for sharing! I'm going to have to give this a try! 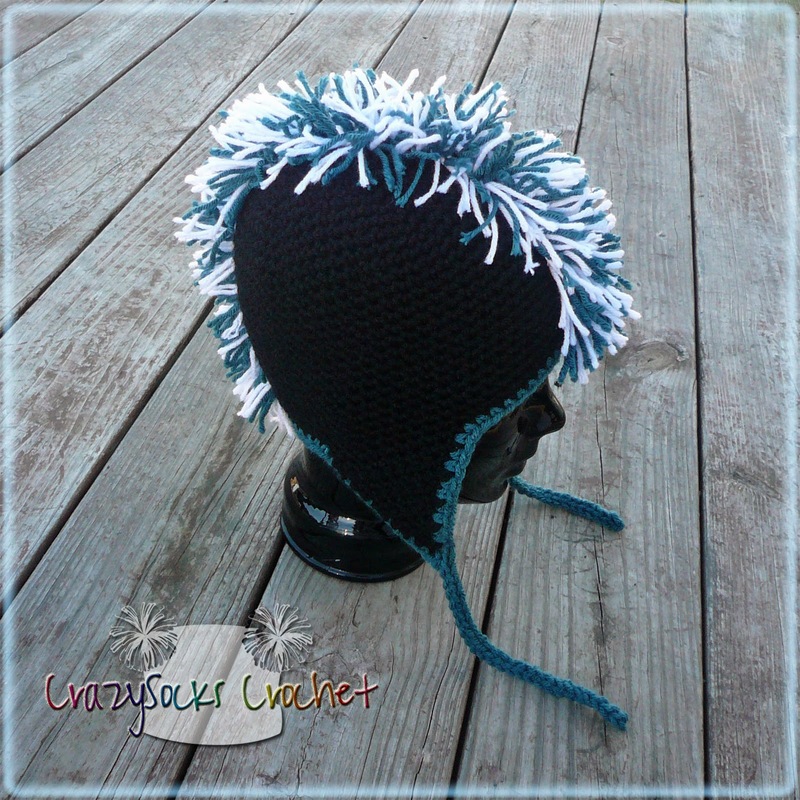 You know, I've been looking all night for a good how-to or pattern for a mohawk hat, and the mohawking on this is BETTER than patterns that people are charging $5 and up for. thanks for the pattern ! You're base hat looks amazing, I can't find a pattern like it, and I don't have the money to spend on the pattern. Does the yarn of the mohawk fray? How can I avoid this happening? I made one and frayed the yarn and it looks awesome! Can't wait to make these. Thanks so much! Do you have to knot it or something once you pull the hairs through so they don't come out?? The mohawk will fray a little over time... but that also depends on the yarn you use. There are lots of SC hat patterns online... some are free, some are not. Thanks for sharing! I am making one for my nephew who snowboards! It will look great on the slopes! Here is a link back to my hat that I made from you tutorial. Thanks. I am gonna try it! Thanks for sharing!! This is the cute. I'm new to this blog stuff. I'm setting up a blog and facebook page now. Wish me luck and again I just love this hat. Do you make up all your patterns??? After you make the hat do you just make a running stitch down the center so you get it straight? Sorry I didn't reply sooner... but I just use a needle & a scrap piece of yarn to mark the center line. Finally finished mine and use the "Pat hat" pattern. Came out super cute. I'm glad you recommended the latch hook...would have taken me MUCH longer using the crochet hook. Thank you!